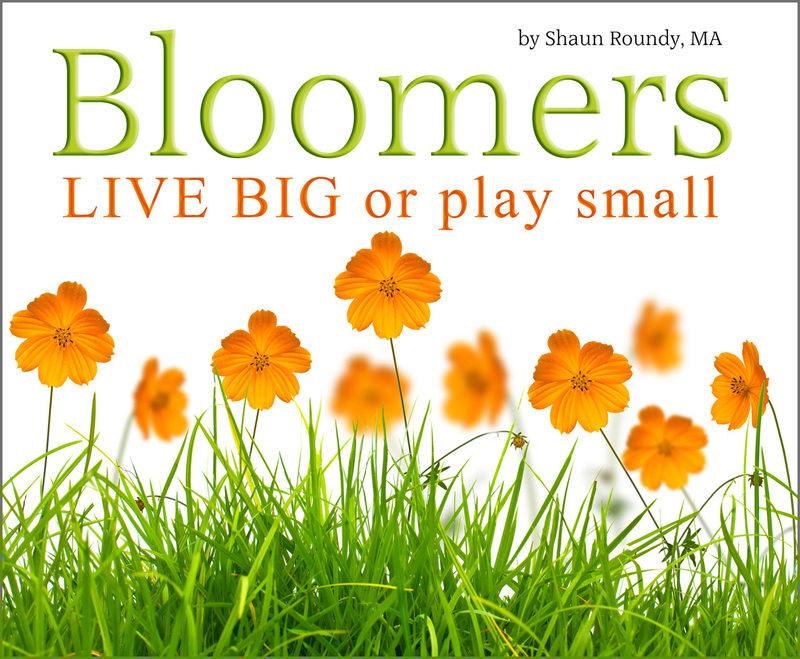 Get Bloomers on Amazon Kindle for only .99 cents! You were born to bloom, but you didn’t count on so many thorns! So what will you do? Will you LIVE BIG or play small? Both paths offer their unique style of reward and suffering. This fable shows you how life works…or doesn’t…and reminds you that the choice of how to live is all yours. The story is short but expertly crafted to point out the wonderful purpose of living, the way others tear us down and hold us back – if we let them – and what happens when we reject discouragement and play out our highest potential against all odds. Anyone not living up to their full, glorious potential would do well to read and reread Bloomers on a regular basis! of kids in my neighborhood – I wanted to let them know how highly I thought of them and their potential. Two friends later used the story in church lessons and reported quite an impact. The first said she made everyone in the room cry (the good kind!) and the second, who used it for a youth group, said that even months later, parents would mention that the story changed their child’s life. Every time I happen to read the story, I realize that I wrote it for myself as much as anyone else. It reminds me that one of the surest solutions to conquer any type of discouragement is to exercise the courage to stand up and be my best self, despite any opposition. This last time, I also decided I should make the story available on Kindle even if it’s not yet illustrated and ready for print. If Kindle let me list Bloomers for free, I would. 99 cents is the minimum (how some publishers list books for free is not public information). It’s an important reminder that most of us could use. If you like it, please spread the word! Share this on Facebook, your blog, etc. I’ll post the story here instead. Once upon a time, in the rich brown dirt of a flower patch, a tiny seed cracked open. A thin green leaf tumbled out and a thirsty root dug into the soil. The miracle of life had begun. Aster grew toward the bright sun, its pleasant warmth soaking into his petals. Day by day, his long lavender petals grew bigger and bigger. Aster looked around and noticed something very odd. All the other flowers had very small petals and great big thorns growing up and down their stalks. “You’ll be sorry,” replied the flower. As they spoke, dark clouds covered the sun. Shadows spread across the flower patch. Rain fell, wind blew, and the thin flower stalks rattled dryly against each other. But Aster did not see. And so he grew and grew and grew. His petals stretched out wider every day. The sun warmed them and made him feel oh, so happy to be alive. Soon other flowers began to notice Aster’s big petals. “You’re blocking my sunlight!” complained one. Some compared Aster’s handsome petals to their own scrawny stalks and ugly thorns and got depressed. Some bristled their thorns menacingly. “You’ll be sorry,” they threatened. And the flower stalks rattled dryly against each other. But Aster did not merely rattle. 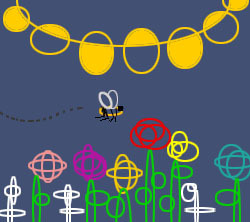 The wind caught his big petals and tossed him back and forth through the flower patch. His soft petals caught on the sharp thorns. Some were punctured and torn. Others ripped right off. “Ouch!” Aster cried. “You’re hurting me!” But there was nothing anyone could do to stop. When the rain stopped and the winds faded, Aster looked at himself. He looked terrible. He ached where his petals were torn away. He had no idea petals could hurt so much. “I tried to warn you,” said the flower next to him. “That’ll teach you not to show off,” said another. Slowly, Aster began to regrow his petals. This time, however, the petals came out small. “I don’t want to go through that again!” he said to himself. Aster tried to enjoy the warm sunshine on his tiny petals, but they simply couldn’t collect enough light, and he always felt cold. Time passed and one day Aster felt a curious urge. It felt strangely familiar and faintly delicious. A gentle pressure welled up deep inside his stalk and was trying to get out. Aster hadn’t felt this pleasant sensation since he was just a young sprout. Suddenly Aster recognized the feeling – it was the urge to grow! The sweet desire to open his petals wide and stretch upward toward the sun! The instant Aster recognized the urge, he felt afraid! He remembered the terrible pain that petals cause when the wind blows. Aster didn’t dare let his petals grow! He must fight to keep them small at all costs! As Aster fought to keep his petals from growing, he felt another strange pressure inside his stalk. He glanced down and noticed his thorns grow bigger and bigger. The growth had to go somewhere. Aster sighed. The thorns were ugly and uncomfortable, but what could he do? And Aster didn’t hurt this time. But when the clouds left and the sunshine returned, he didn’t enjoy much, either. The days all felt cold and boring. Aster looked around and realized that living in the flower patch wasn’t nearly as happy as he once thought. Days blurred into weeks, weeks blurred into months, and months blurred into a continual gray twilight. Time passed and one day Aster noticed something unusual. A small flower named Rose had sprouted next to him and was growing big, red petals. “I think they feel wonderful!” Rose said, spreading them even wider in the warm sunlight. Aster envied Rose and wanted so much to do the same. But the shadows would surely return, and then Aster wouldn’t envy her at all. “You’ll be sorry,” said others. But Rose paid no attention and continued basking joyfully in the warm sunlight. And Rose’s petals were ripped to shreds and torn away. “I tried to warn you,” said a nearby flower as Rose whimpered in pain. “You should listen to your elders,” said a very old, dry, shriveled flower who looked exactly like all the others. “I told you petals hurt,” Aster said sympathetically. Slowly, Rose began to regrow her petals. “You’ll be sorry,” tired old flowers whispered in dry, raspy voices. “You already are sorry!” replied Rose. “You’ll block my light!” some complained. “You weren’t using it anyway,” Rose pointed out. “You’ll make me feel bad about myself,” others whined. “Then grow your own petals!” Rose suggested. “Why can’t you just fit in with the rest of us?” someone asked. Rose was right! Aster didn’t want to feel miserable anymore. He didn’t want to be ugly. He didn’t want to feel cold! In fact, he couldn’t even remember how it felt to be warm. That was the last straw! Aster couldn’t stand it any more! He decided to grow his petals back no matter the cost! It took some effort after so much time, but little by little, his petals spread out wider and wider. The other flowers issued their same old warnings and complaints; but this time, Aster paid no attention. As the sunlight soaked into their petals, their roots grew thirsty and drank up more water. Their stalks grew strong and tall, and Aster’s thorns grew smaller and smaller. Passing bees often stopped and gathered nectar to make sweet honey. And as Aster and Rose rocked back and forth together, they discovered something wonderful! They had both grown high above the surrounding thorns and their petals were not hurt. Other flowers took note and began to grow out their own petals. Flowers of many shapes and colors appeared in every direction. The miracle of life had begun. The air turned sweet with fragrance and the flower patch became a glorious and joyful place to live. As the flowers discovered how wonderful it feels to grow and bloom, their thorns faded slowly away. Some flowers refused to change. These remained small and stunted and were left behind as others shot upward toward the sun. Answer & discuss these questions to put the wisdom of Bloomers to work for you! 1. What does the flower patch represent? 2. What do petals represent in the story? 3. What does the sun represent? 4. What do the clouds, wind and rain represent? 5. What do the thorns represent? 6. How do people sometimes discourage us from developing and showing off our talents? 8. What talents have you kept “small” to avoid the vulnerability or criticism? 9. How do you feel when you stay “small”? 10. How do you feel when you bloom? 11. How do your talents make the world a more beautiful place? 12. How much difference can one person make? 13. List your friends’ and associates’ petals. 14. How do you feel when you see others enjoying their talents? 15. What “thorns” do you have? 16. List your friends’ and associates’ thorns. 17. Would you rather live in a world with big petals or big thorns? 18. Is it worth growing your petals despite the thorns? 19. How can you help encourage and inspire others to grow their petals? The Kindle version also has an “Are YOU a Bloomer?” Workbook Answer Key with possible answers to these questions.